With no confirmed appearance and the game's director staying in Japan, it seems Team Ico's latest project may pass on E3. 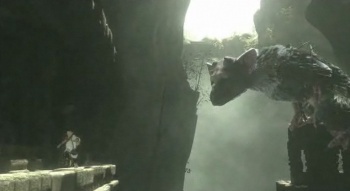 The Last Guardian game director Fumito Ueda (Ico, Shadow of the Colossus), recently announced on Twitter that he will not fly out to Los Angeles to attend this year's conference, and it's unlikely Sony will show a demo or new footage of the game without him present. After all, Sony press conferences have a history of putting a game's creator front-and-center when presenting. Although, that doesn't mean it's completely out of the realm of possibility. The Last Guardian's strong showing at Tokyo Game Show in September made the much-anticipated game seem just around the corner. However, Sony pulling the game, last minute, from March's Game Developers Conference made an imminent release doubtful. It's safe to assume progress slowed on the game, after the recent quakes and power outages in Tokyo. Last month, Team Ico pushed back both The Last Guardian and the HD Ico and Shadow of the Colossus Collection - no release window was given for either. After SotC left gamers in awe of what the creative minds at Team Ico can do with old hardware, Team Ico became one of Sony's most beloved studios. Since rumors of the game's development circulated in early 2008, Team Ico fans have had a long wait for details and footage. The last of which was shown nearly a year ago at Tokyo Game Show, which will likely be home to whatever Ueda unveils next -- assuming it's not already shown at this year's E3.